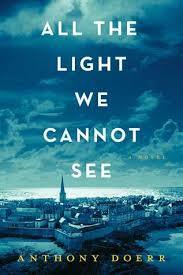 I’m very excited to begin reading All the Light We Cannot See. I have been on the library’s waiting list for six months and I finally made it to the top! Click on this link to see what Doerr thinks about winning the 2015 Pulitzer Prize. Can’t wait to hear your review! Started it last night – it’s good! Sounds like a gripping read – I can’t wait to read your review! Thanks – started it last night! And thanks for reading and commenting!